and has remained so for thirty years. He is a fellow of Oxford College at Merton and has written over 40 books, some on Churchill, such as his multivolume treatise called "Churchill" as well as books on the Holocaust, "Surviving the Holocaust" and books on the war itself, "The Second World War." Long after Churchill died, Gilbert chronicled his efforts in the war and in making the world a better place for all her people to exist. He continues to write on the struggles of Jews during the war and the histories of this world, from culture to culture. When Winston Churchill beccame Prime Minister on 10 May 1940, he had been a Member of Parliament for almost forty years. For more than twenty-five of those years he had held high ministerial office, with responsibilities that covered many spheres of national policy and international affairs. Central to the strength of his war leadership was this experience. 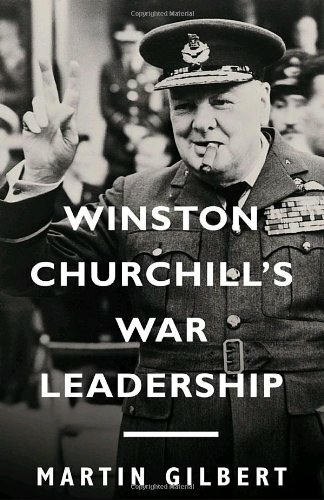 Churchill could draw upon knowledge acquired in the many fierce political battles and tough international negotiations in which he had been a central and often successful participant. "My knowledge, which has been bought, not taught," was how he expressed it in the House of Commons during a stormy interwar debate on defence. Churchill's knowledge had often been bought at the price of unpopularity and failure. But, above all, it was the experience of dealing, both as a Cabinet Minister from 1905 and as a member of the Committee of Imperial Defence from 1909, with a wide range of national and world issues, and also of persuading a frequently hostile House of Commons to accept the logic and argument of government policy. That experience served as an essential underpinning-and strengthening-of his leadership in the Second World War. For a decade before the First World War, four Prime Ministers-Campbell-Bannerman, Asquith, Lloyd George and Baldwin-each entrusted Churchill with contentious issues, having a high regard for his negotiating and persuasive skills. The experience he gained was considerable. In 1911 he had been a pioneer of industrial conciliation and arbitration at a time of intense labour unrest. In 1913 he had led the search for an amelioration of Anglo-German naval rivalry. In 1914 his duties as First Lord of the Admiralty (the post he was to hold again on the outbreak of war in 1939) included both the air defence of London and the protection of the Royal Navy and merchant shipping from German naval attack. In 1917 he was put in charge of munitions production in Britain at a time of the greatest need and strain. In 1919 he devised, as a matter of urgency, a system of demobilization that calmed the severe tensions of a disaffected soldiery. In the early 1920s he had been at the centre of resolving the demands of Irish Catholics for Home Rule and of the first-and effectively the last-border delineation dispute between Southern Ireland and Ulster. At the same time, he had undertaken the complicated task of carrying out Britain's promise to the Jews of a National Home in Palestine after the First World War. This experience of dealing at the centre with Britain's major national needs, during more than three decades, gave Churchill a precious boon from the first days of his premiership. It also provided him with many specific pointers to war direction. A quarter of a century before he became Prime Minister, he had seen the perils that accompanied the evolution of war policy when there was no central direction. He had been a member of the War Council in 1914, when the Prime Minister, Asquith, had been unable to exercise effective control over the two Service departments-the army and the navy. To redress this problem, on becoming Prime Minister in May 1940, Churchill created the post, hitherto unknown in Britain, of Minister of Defence. Although the new Ministry had no departmental structure as such, it did have a secretariat, headed by General Hastings Ismay, who served, with his small staff, as a direct conduit between the Prime Minister and the Chiefs of Staff-the respective heads of the army, navy and air force. This structure enabled Churchill to put forward his suggestions directly, and with the utmost directness, to those who would have to accept or reject, modify and implement them. The organization of his wartime premiership was a central feature of Churchill's war leadership. That organization took several months to perfect, but from his first days as Prime Minister and Minister of Defence he worked to establish it, and to create in the immediate ambit of 10 Downing Street an organization that would give the nation strong and effective leadership. At its core was the close relationship between Churchill and the three Chiefs of Staff. Their frequent meetings, often daily, enabled him to discuss with them the many crises of the war, to tackle the many emergencies, and to decide on an acceptable common strategy. Working under the Chiefs of Staff, and in close association with Churchill through the Ministry of Defence, were two other essential instruments of military planning: the Joint Planning Staff (known as the "Joint Planners") and the Joint Intelligence Committee. Other essential elements of the organizational side of Churchill's war leadership evolved as the need arose, among them the Production Council, the Import Executive, the Tank Parliament, the Combined Raw Materials Board (an Anglo-America venture), the Anglo-American Shipping Adjustment Board, and the Battle of the Atlantic Committee of the War Cabinet. And always to hand was the apparatus of Intelligence gathering, assessment and distribution, controlled by the Secret Intelligence Services headed by Colonel (later General) Stewart Menzies, with whom Churchill was in daily communication. In his Minutes to Menzies, Churchill made whatever comments he felt were needed on the nature, implications and circulation of Intelligence material. This organizational structure gave Churchill a method of war leadership whereby the highest possible accumulation of professional knowledge was at his disposal. He was not a dictatorial leader, although he could be emphatic in his requests and suggestions. If the Chiefs of Staff opposed any initiative he proposed, it was abandoned. He had no power to overrule their collective will. But on most occasions there was no such stark dichotomy. He and they were searching for the same out-come-the means, first, to avert defeat; then to contain and, finally, to defeat Germany-and in this search they were in frequent agreement. One of the members of Churchill's Private Office, John Peck, later recalled: "I have the clearest possible recollection of General Ismay talking to me about a meeting of the Chiefs of Staff Committee at which they got completely stuck and admitted that they just did not know what was the right course to pursue; so on a purely military matter, they had come to Churchill, civilian, for his advice. He introduced some further facts into the equation that had escaped their notice and the solution became obvious." A crucial aspect of Churchill's war leadership was his private secretariat, the Private Office at 10 Downing Street. Members of his Private Office accompanied him wherever he went, whether in Britain or overseas, and were available to help smooth his path during every working hour, often until late into the night. At its centre were his Private Secretaries: civil servants, mostly in their thirties, who remained at his side on a rota system throughout the week and the weekend. They were privy to his innermost thoughts (although not, ironically, to the decrypted Enigma messages on which so many of those thoughts hinged). They knew how to interpret his briefest of instructions, some of which were scarcely more than a grunt or a nod of the head. They knew how to find documents and to circulate them. They kept his desk diary with its myriad appointments. They also ensured that whatever the Prime Minister needed-a document to study, a file to scrutinize, a colleague to question, a journey to be organized, a foreign dignitary to be received-all was ready at the right time and in the right place. Given the scale of Churchill's travel in Britain and overseas, and his notorious unpunctuality and indecision in little things, this streamlined operation was impressive. In a private letter to General Sir Bernard Montgomery, Clementine Churchill referred to her husband's "chronic unpunctuality" and "habit of changing his mind (in little things) every minute!" For example, his Private Secretariat was caused endless vexation as to whether he would receive some important visitor at 10 Downing Street, at No. 10 Annexe a hundred yards away, or in the Prime Minister's room in the House of Commons. Churchill could also show uncertainty regarding the large decisions, rehearsing them in his mind and hesitating for long periods before settling on a course of action. One such instance was the difficult decision, which he supported, to send British troops to Greece to take part in the defence of that country against a possible German attack, thus weakening the British forces that were then defending Egypt. In the end, he asked for every member of his War Cabinet to vote on this matter. The unanimous vote was in favour of showing Greece that she was not to be abandoned by her ally, despite the hopelessness of the situation, given German military superiority. The names of most of the members of Churchill's Private Office are little known to history. Only one, John Colville-who started as the Junior Private Secretary in 1940-subsequently made his mark, one of great importance to history, because he kept a detailed diary (quite against the rules) of those days when he was on duty. Neither the first Principal Private Secretary, Eric Seal, nor Seal's successor John Martin, nor the other members of the Private Office-John Peck, Christopher Dodds and Leslie Rowan-kept anything more than a few jottings and private letters. The whole team constituted, collectively, the support system on which Churchill depended and from whom he obtained first-class service, ensuring the smooth running of the prime ministerial enterprise at its centre. The members of his Private Office sustained him without publicity or fanfare, but with a professionalism and a devotion that helped to make his leadership both smooth and effective.